This monster is the cover card for the first TCG expansion: Legend of Blue Eyes White Dragon. This monster is Seto's signature card. It shares its 3000 ATK with the rivals of other series, which are Chazz's Armed Dragon LV10, Jack's Red Dragon Archfiend, Kite's Galaxy-Eyes Photon Dragon, Declan's D/D/D Doom King Armageddon and Varis' Borreload Dragon. It can be used to summon Number 38: Hope Harbinger Dragon Titanic Galaxy, which also shares the 3000 ATK and 2500 DEF. In the Viz translation of Kaiba's Duel against Ishizu, Kaiba states that the Blue-Eyes embodies his soul. Jack Atlas calls his Red Dragon Archfiend waga tamashi, which translates as my very soul in the Japanese, and Kite has called Galaxy-Eyes Photon Dragon his soul (ore no tamashi). Despite being called a white dragon, this monster is usually depicted as a blue dragon. After Token, this card has the most alternate artworks in the OCG/TCG with eight in total, beating out the next contender, Dark Magician, by one. This excludes Dark Magician Girl, who technically has the most artworks, due to small censoring differences between the Japanese and international versions. In Yu-Gi-Oh! The Movie, it is said that this card is a symbol of power, and Red-Eyes is a symbol of potential. This is an accurate way to describe the two Monsters. While Blue-Eyes has higher stats, Red-Eyes is more flexible, even more so now because of Meteor Black Comet Dragon. Also, Blue-Eyes White Dragon symbolizes pride and destruction, while Red-Eyes symbolizes violence and anger. There are two things that back this up. In Yu-Gi-Oh! The Sacred Cards, Blue-Eyes is said to actually be proud of its destructive power, while Red-Eyes is described as a superviolent creature. Their owners share these personality traits. Seto Kaiba, who has had countless victories, is known for being boastful and vain. Joey Wheeler was once a bully, and is shown to have a harsh temper when ridiculed. The purpose of the Blue-Eyes archetype is to destroy the opponent's cards, while Red-Eyes's gimmick is inflicting Burn damage. With the release of Starter Deck Kaiba Reloaded, this card is the only card that has been printed in all rarities in the TCG (except Starfoil Rare, Shatterfoil Rare and Mosaic Rare). This card has four younger versions: the Tuner monsters The White Stone of Ancients and The White Stone of Legend, the dragon displayed in the card Paladin of White Dragon, and Dragon Spirit of White. This card has the highest ATK of all Normal Monsters. Fittingly, it is the Fusion Material for the non-Effect Monster with the highest ATK, Blue-Eyes Ultimate Dragon. This monster appears in the artworks of Burst Stream of Destruction, Dimension Explosion, Dragon's Fighting Spirit, Majesty with Eyes of Blue, Meteor Stream and Rage with Eyes of Blue. This card's third and fourth OCG/TCG artworks are taken from this monster's depiction on the title page of . In Yu-Gi-Oh! The Falsebound Kingdom, the three Blue-Eyes White Dragons are named Azrael, Ibris (a mistranslation of Iblis), and Djibril. These are the Islamic names for the Angel of Death, Satan (Iblis), and the angel Gabriel, respectively. Azrael is an informal name, only occurring in non-religious sources (including both Sikhism and some Jewish lore as well), while Iblis is the lord of the jinn, rather than the principal fallen angel. In the Yu-Gi-Oh! manga and anime series, there's a mysterious woman named Kisara that carries the spirit of the Blue-Eyes White Dragon. Maiden with Eyes of Blue is based on her. This cards shares similarities with Cyber Dragon. Their Fusions require two (Blue-Eyes Twin Burst Dragon and Cyber Twin Dragon) or three (Blue-Eyes Ultimate Dragon/Neo Blue-Eyes Ultimate Dragon and Cyber End Dragon) copies each. Both of their final form (Cyber End Dragon and Blue-Eyes Shining Dragon) have similar blue orbs on their wings and chests. In Yu-Gi-Oh! GX, Cyber Dragon also serve as a spiritual successor to Blue-Eyes White Dragon. In some Yu-Gi-Oh! video games (Dark Duel Stories), this card has an ally, the Mystical Elf, which can increase the ATK and DEF of this card by 500. In most expansion sets, Blue-Eyes White Dragon cards have the Set Number -001. This card is arguably one of the most recognizable monsters in the game, along with Dark Magician. This card along with Dark Magician are the only 2 cards to have had an official Chinese print before the release of Duel Starter Deck standardized Chinese as an OCG language. Its Chinese version originated in Japan, therefore its Chinese name includes the character 黒 (black) which is an exclusive one to Japanese, compared to the Chinese counterpart, 黑. The Weekly Shonen Jump March 2014 membership promotional version of Blue-Eyes White Dragon is the first card to be printed with an italicized Matrix typeface used for its card text. On every card before it, the Matrix font is only used in regular type (not bold, not italic). Ironically, while this card has been printed in several sets in the TCG/OCG, making it one of the most common cards of all time, this card is one of the rarest officially-printed cards of all time in the anime/manga with only 4 copies having been printed ever. The Jump Ryū Vol.08 promotional card print of this card features Seto Kaiba in its artwork. In the video game Yu-Gi-Oh! Duel Links, when this card is summoned by Kaiba the summon animation is altered during April Fools' Day 2017. In this animation Blue-Eyes wears a KaibaConstruction construction helmet - similair to the sketch shown during game maintance periods when attempting to log in, and a sign in Yu-Gi-Oh! The Dark Side of Dimensions movie. "Bottomless Trap Hole: If the opponent has "Lord of D." on the field and activates "The Flute of Summoning Dragon" to Special Summon 2 copies of "Blue-Eyes White Dragon", you can activate this card and both will be removed from play. "Lord of D." does not protect the Dragons because "Bottomless Trap Hole" does not target. The same situation would occur if only 1 "Blue-Eyes White Dragon" was Special Summoned, "Bottomless Trap Hole" still does not target. Burst Stream of Destruction: If you activate "Burst Stream of Destruction", and the "Blue-Eyes White Dragon" is removed from the field with "Interdimensional Matter Transporter" or "Compulsory Evacuation Device", or flipped face-down with "Book of Moon", or destroyed by "Ring of Destruction", "Burst Stream of Destruction's" effect still resolves. Burst Stream of Destruction: If "Burst Stream of Destruction's" activation is negated by "Magic Jammer", then "Blue-Eyes White Dragon" can attack. Burst Stream of Destruction: NO copies of "Blue-Eyes White Dragon" can attack the turn that "Burst Stream of Destruction's" effect is applied, even if they are Summoned after "Burst Stream of Destruction" is played. Destiny HERO - Diamond Dude: Since you are only activating the Normal Spell Card's effect, and not the Normal Spell Card itself, you do not pay costs and you do not have to meet any activation requirements. For example, you would not pay 1000 Life Points for "Confiscation", or discard 1 card for "Monster Reincarnation", or need a "Blue-Eyes White Dragon" on the field to activate the effect of "Burst Stream of Destruction". Double Attack: If you use “Cost Down” so that your “Blue-Eyes White Dragon” in your hand is Level 6, then you cannot discard it to activate “Double Attack” and target your Level 7 “Dark Magician” on the field. Inferno Tempest: If you attack "Blue-Eyes White Dragon" with "Ojama Green" or some other 0 ATK monster, you can activate "Inferno Tempest" after damage calculation. Then "Ojama Green" is sent to the Graveyard after "Inferno Tempest" resolves. Last Turn: You CAN Special Summon a high-level monster that has no Special Summoning restrictions for “Last Turn”, such as “Blue-Eyes White Dragon” or “Dark Magician of Chaos”. Pole Position: If "Pole Position" is active, and your opponent controls "Blue-Eyes White Dragon" and "Skull Servant", and you activate "Smashing Ground", "Blue-Eyes White Dragon" is unaffected by Spell Cards, so the effect of "Smashing Ground" disappears. Pole Position: If you control "Dark Magician" and your opponent controls "Blue-Eyes White Dragon", and you activate "Flint" targeting "Blue-Eyes White Dragon", and your opponent chains "Pole Position", then "Flint" is equipped meaninglessly to "Blue-Eyes White Dragon". 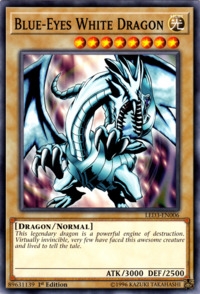 If "Blue-Eyes White Dragon" is destroyed, "Flint" can be equipped to "Dark Magician" meaninglessly if you choose (even if other monsters are on the field). Pole Position: EXAMPLE #2: The opponent has "Blue-Eyes White Dragon" (3000 ATK) and “Pole Position face-up on the field. I have "Gemini Elf" (1900 ATK), and an "Opticlops" (1800 ATK) equipped with "Axe of Despair"(+1000 ATK; 2800 total) face-up on the field, and a Set "Ring of Destruction". If I activate "Ring of Destruction" to destroy "Blue-Eyes White Dragon", then “Opticlops” will be the highest ATK monster on the field, and cause an infinite loop (it is the highest, it isn’t, it is, it isn’t, etc.). Therefore, I cannot target “Blue-Eyes White Dragon” with “Ring of Destruction”. Precious Cards from Beyond: If you Tribute Summon "Blue-Eyes White Dragon" for 1 Tribute using "Cost Down", you can't activate "Precious Cards from Beyond"s effect. Silent Swordsman LV5: If you control “Blue-Eyes White Dragon” and “Silent Swordsman LV5”, and your opponent activates “Fissure”, the monster with the lowest ATK is “Silent Swordsman LV5”, but it is unaffected by Spell Cards, so the effect of “Fissure” disappears. Skill Drain: "Skill Drain" does not stop you from activating Ignition Effects, but it does negate their effects as long as the Effect Monster remains on the field. If you Tribute "Paladin of White Dragon" to activate its effect while "Skill Drain" is active, it is no longer on the field and you can Special Summon "Blue-Eyes White Dragon". Waboku: SCENARIO 3: Player A activates "Waboku". Player A's "Blue-Eyes White Dragon" then attacks Player B's "Sanga of the Thunder". Player B uses "Sanga of the Thunder"s effect (during the Damage Step). RESULT: Player A's "Blue-Eyes White Dragon" (ATK 0) is not destroyed, nor does Player A lose any Life Points, because of Player A's "Waboku". If the "You can Tribute this card; Special Summon 1 "Blue-Eyes White Dragon" from your hand or Deck, but "Blue-Eyes White Dragons" cannot attack for the rest of this turn." effect of "Paladin of White Dragon" is used, then no "Blue-Eyes White Dragon" can attack this tun even if they were already face-up on the field. : If the "You can Tribute this card; Special Summon 1 "Blue-Eyes White Dragon" from your hand or Deck, but "Blue-Eyes White Dragons" cannot attack for the rest of this turn." effect of "Paladin of White Dragon" is used, then can "Blue-Eyes White Dragons" that were already face-up on the field still attack?